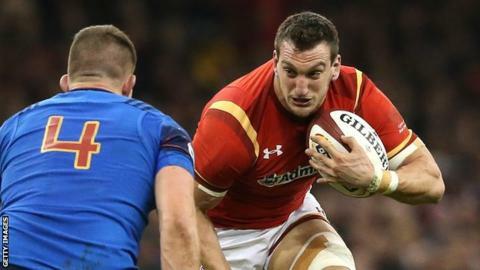 Wales coach Warren Gatland has named Sam Warburton to lead a 35-man squad on their summer tour of New Zealand. Warburton injured a shoulder playing for Cardiff Blues against Ospreys on 30 April, and has not played since. Injured Toulon full-back Leigh Halfpenny is left out, but second row Alun Wyn Jones - out since the defeat by England on 12 March - is included. Wales face England at Twickenham on 29 May before playing three Tests against the All Blacks in June. Gatland says Halfpenny could return with Toulon in the coming month and could be on standby for Wales as injury cover. And Ospreys lock Jones is likely to "have some game time" against England two weeks before the first Test against the All Blacks. They have not beaten New Zealand since 1953 - a run of 26 consecutive defeats. Facing the World Cup holders has led Gatland to pick an experienced squad. Gatland said: "I don't think New Zealand is a place to be blooding youngsters so we've gone for the most experienced team that we could pick for what's going to be an incredibly tough tour with England first up." Gatland has opted not to select a direct replacement for injured open-side flanker Justin Tipuric. Scarlets' James Davies and Ellis Jenkins of Cardiff Blues were touted as possible replacements, but the New Zealander has opted for Josh Turnbull, James King and Ross Moriarty as back row cover. King and Moriarty will cover Warburton's open-side role and Davies' absence leaves him free to play for Great Britain Sevens at the Rio Olympics if selected. "We do have other options in terms of someone like James King who's played there (open-side) at the end of the season and Ross Moriarty had a lengthy spell against Italy and scored a couple of tries and played exceptionally well and Josh Turnbull has played at seven as well. "So we've got a lot of cover in those areas. "There were a few youngsters knocking at the door, but we've decided to go with as much experience as we could." Ospreys' Clermont Auvergne-bound prop Aaron Jarvis is left out with Rhodri Jones, who is on his way from Scarlets to Ospreys, coming in. Behind the scrum, wings Tom James and Eli Walker return while Alex Cuthbert sits out the tour after knee surgery. James played in Wales' two opening 2016 Six Nations games, but was returned to Cardiff Blues with Gatland saying he needed to work on his sharpness. Scarlets' Aled Davies drops out as Rhys Webb, Gareth Davies and Lloyd Williams occupy the scrum-half berths. Having been grouped with the full-backs in Wales' Six Nations squad, Gareth Anscombe joins the fly-half mix alongside Dan Biggar and Rhys Priestland. "It is a great opportunity for us to test ourselves, build on the World Cup and the Six Nations and it's a challenge we are all looking forward to," said Gatland. "We are in a great position in terms of the experience in the squad especially when you look at the age of most of the players and this is going to be another important summer." Backs: Gareth Davies (Scarlets), Rhys Webb (Ospreys), Lloyd Williams (Cardiff Blues), Gareth Anscombe (Cardiff Blues), Dan Biggar (Ospreys), Rhys Priestland (Bath Rugby), Jonathan Davies (Clermont Auvergne), Tyler Morgan (Newport Gwent Dragons), Jamie Roberts (Harlequins), Scott Williams (Scarlets), Hallam Amos (Newport Gwent Dragons), Matthew Morgan (Bristol), Tom James (Cardiff Blues), George North (Northampton Saints), Eli Walker (Ospreys), Liam Williams (Scarlets). Forwards: Rob Evans (Scarlets), Tomas Francis (Exeter Chiefs), Paul James (Ospreys) Gethin Jenkins (Cardiff Blues), Rhodri Jones (Scarlets), Samson Lee (Scarlets), Scott Baldwin (Ospreys), Kristian Dacey (Cardiff Blues), Ken Owens (Scarlets), Jake Ball (Scarlets), Luke Charteris (Racing Metro), Bradley Davies (Wasps), Alun Wyn Jones (Ospreys), Taulupe Faletau (Newport Gwent Dragons), James King (Ospreys), Dan Lydiate (Ospreys), Ross Moriarty (Gloucester), Josh Turnbull (Cardiff Blues), Sam Warburton (Cardiff Blues, Capt).